Epilepsy is a serious neurological disorder that affect 1.2% of the total US populations. According to CDC, there are about 3.4 million people with epilepsy nationwide. 3 million of these are adults and 470,000 are children. It is important to know that anyone can develop epilepsy regardless of gender, ethnic background, or age. There is no need to call an ambulance if a person is known to have epilepsy and the seizure ends in under five minutes. An ambulance should only be called if the person is pregnant, injured, or diabetic, the seizure continues for more than five minutes, a second seizure happens right after the first ended, and consciousness does not return even after shaking has stopped. Seizures do not usually require emergency medical attention especially if a person is diagnosed with epilepsy. Wearing a medical ID is a simple and effective way to communicate epilepsy, even when the person becomes unconscious or unable to speak. 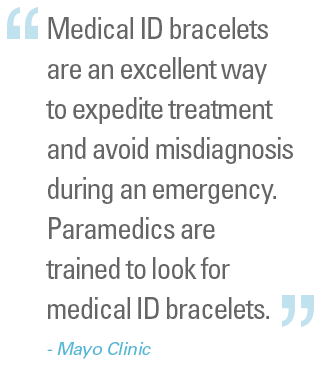 Having a medical alert bracelet or necklace can help avoid unnecessary emergency room visits after a seizure has occurred. Not wearing a medical ID prevents others from knowing whether the seizure is caused by epilepsy or if a person has other medical conditions. This is important for people to know whether they should call an ambulance or not, especially if a seizure only lasts under five minutes.